Rollors Outdoor Game is best described as a combination of bocce ball, lawn bowling and horseshoes. 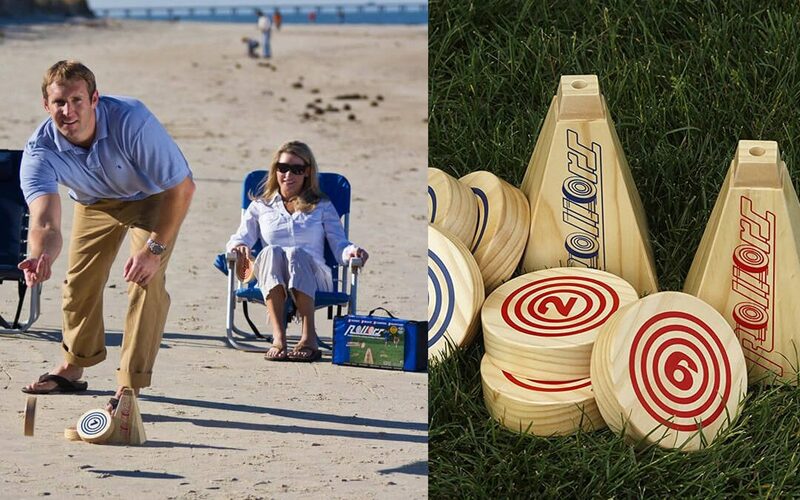 Played with 2 to 6 players, this wooden lawn toss game can be easily played on grass in your backyard, parks, at the beach or any flat ground surface. It’s very easy to setup and play but can also be a fun challenge. We will be the first to say that it is a bit tricky, but this trickiness was also one of the things we liked most about it. Rollors will make a great addition to any backyard party or outdoor event because it is so much fun to play. It will be seen rolling around backyards for generations to come. 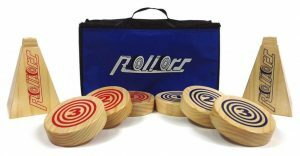 Here is our personal review and instructions for the Rollors Outdoor Lawn Toss Game. The objective in Rollors is to try to roll your piece closer to the goal then your competitor. Think of it as a mix between horseshoes and bocce ball. In horseshoes you have 2 pins at opposite sides and in Rollors you use goals. Each player takes turns rolling their Rollors towards the goals. These goals (cones) are setup 25 feet apart on a level playing surface. A freshly cut backyard grass or hard beach sand are ideal surfaces to play on. The first team to get 21 wins and win by 2 or more points wins! Grab some friends and your Rollors and we will meet you on the field. The first rule of Rollors like any Outdoor Game is to always have fun! Rollers can be played with 2, 4, or 6 people, for this example we will be using the 4 player game. Each player (or team) uses a different set (blue or red) of the Rollors. • Partners sit at opposite sides of the goal and alternate tossing after each round. • Each team has 3 Rollors. For example, the red team starts first and rolls all 3 of their rollers, one after another. Then the blue team rolls all three of their rollers. Then it’s the turn of the other players position at the opposite goal to play. Same as in horseshoes. • Do not throw the Roller, as the name suggests, you must roll the roller. The Rollors must touch the ground within 4 feet from the time leaving the players hand. • The team that won the last round gets to throw first in the next round. The 2 player game is similar except you do not rotate with your partner. The 6 player game also follows the same rules above except for each round every player gets to roll one roller. 1.) If A Rollor lands on their side – Earn The number displayed on that side. 3.) If A Rollor Touches the Goal – Earn Double the points on the side that is showing. Rollors game creators deserves a big high five on their design. The game pieces are made up of sturdy wood and are very durable. They game set include 3 Red Rollors, 3 Blue Rollors, 2 Goals, and 1 Measuring Cord. Some reviewers have mentioned that the game pieces get scratched up when playing on a hard surface like cement. My only complaint about it (and this is so minor) is that the measure cord is stretchy. Sometimes when the Rollors are really close to the goal and you are measuring with the stretch cord it can leave a little up for debate. We take our Rollors Lawn Toss Games really serious in our backyards and so should you. There are also multiple expansion packs that can be ordered, essentially the throwing rollers in different colors so you can expand the game to be played with even more players. Rollors is a game that you can make as easy or complicated as you want. It is a bit of a tricky game at first but once you get the roll down you will love it. It is a game that kids can play and in fact has won many kids awards including Dr. Top Top 10 Active Games & Creative Child Seal of Excellence Award. If you want to make it easier for kids simply move the goals closer to each other. Instead of 25 feet play anywhere from 10-20 feet between goals. It has also won the 2015 Men’s Journal ‘Gear of the Year’ Award. If you want to make it harder for adults, move the goals back and change the 5 feet scoring radius to 3 or so. Feel free to make up your own rules or variations. Rollors will be one of those classic backyard games that will be enjoyed and played for years. It is best played on a freshly cut backyard or hard beach sand by the ocean. If you are a big fan of Bocce, Ladderball, Horseshoes, or well pretty much any tossing game, you will enjoy it. It is simple enough to play but hard to master and that is why we play this game regularly with friends. There are some aspects of luck but even more aspects of skill. We also love this game because of it’s story. It was developed by a marine while deployed in Iraq and Afghanistan and loved by family and friends when tested at BBQ’s back at home. Upon returning home, during the recession he gave other veterans a job to product this game in the US. We love when quality games are manufactured in the US! Rollers has been featured in our Ultimate List of Outdoor Game, Outdoor Games for 4 people and Backyard Games for Kids List. Get your own Rollers Game today, click here to get the latest price. Roll your way to an awesome time at your next beach day or backyard get together.